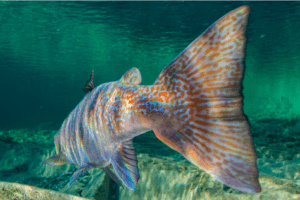 On April 2, 2019, Catherine McKenna, the federal Minister of Environment and Climate Change approved the production of genetically-modified Atlantic salmon by AquaBounty Technologies at Roll Bay in Prince Edward Island. This may represent the first genetically modified animal for human consumption anywhere in the world. 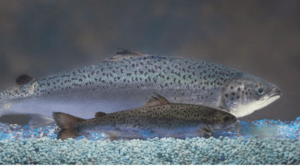 The new fish includes genes from Pacific Chinook salmon (for size) and ocean pout (for cold-water tolerance). AquaBounty has been working on the project for the past 20 years and received the green light in 2016 from the Canadian Food Inspection Agency and Health Canada to proceed. 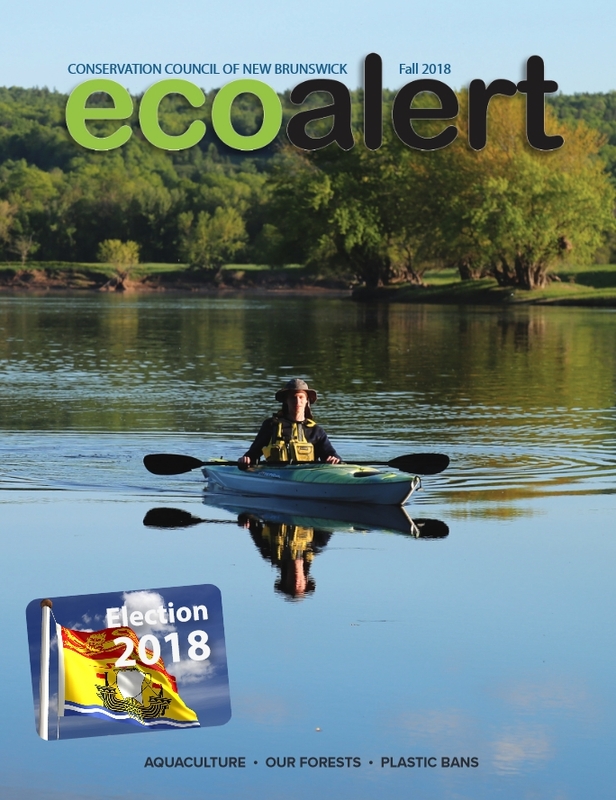 The final stage of the process was the environmental assessment conducted by Environment Canada and approved and announced by McKenna on Sunday. AquaBounty plans to produce some 250 tonnes of GM Atlantic salmon in its first year of operation. What does this mean and should people be concerned? The answer to that question is complicated. The demand for fish from our ever-growing global human population is huge: about a third of people consume fish as their primary source of protein, and this will no doubt grow as beef and other environmentally-taxing land-based meats become less and less sustainable. Further, 90% of wild fisheries are in trouble, with some scientists estimating a complete global collapse by 2050. 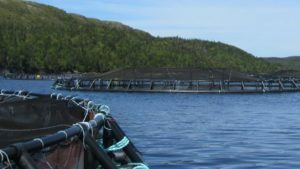 Aquaculture, specifically finfish practices, is a relatively new phenomenon that started in New Brunswick in the early 1970s, for better or worse, along the north shore of the Bay of Fundy. The industry has certainly had its fair share of criticism and has been responsible for various forms of environmental problems – from sea-lice to the use of illegal pesticides to genetic contamination with wild fish. But this isn’t the question we should be asking. The real question is: will farmed fish, genetically modified or not, feed the most disenfranchised and help create planetary sustainability for humans in an equitable way? The answer to this question is more simple: no. 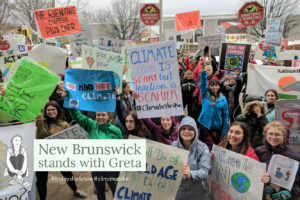 Just eighteen days prior to Minister McKenna’s announcement about GM Atlantic salmon, more than 1.5 million young people across 135 countries walked out of school to draw attention to our collective inaction on climate change and environmental injustice. 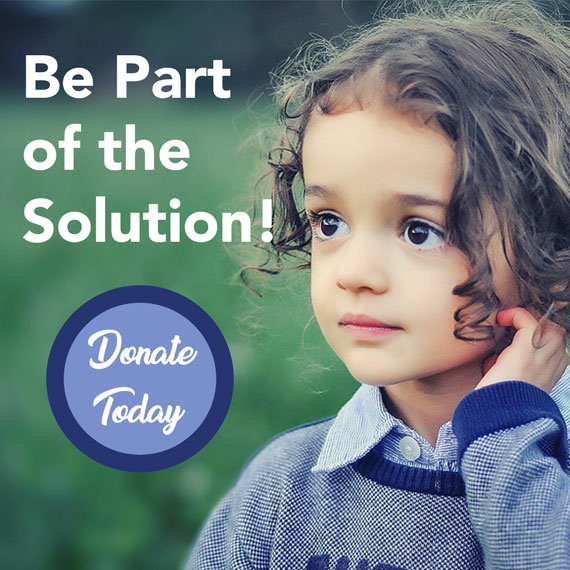 Led by sixteen-year-old Greta Thunberg of Sweden, their request of politicians and leaders was a wholesale change in the way we consume and distribute wealth and resources. The products of finfish aquaculture and especially genetically-modified aquaculture will never end up on the dinner plates of people from sub Saharan Africa or Ecuador or even the communities close to the AquaBounty farms in eastern P.E.I., like Red Point or Eglinton. It is too expensive. These products are largely if not exclusively consumed by the richest 1% of us. Further, and most importantly, the energy, financing and resources required to farm fish takes away from the urgent need to restore our natural ecosystems. Biodiversity — the wild, living things that together form incredibly interconnected systems which provide our fresh water, air and healthy soils — is fundamentally responsible for our survival. Open or closed-contained aquaculture pens do nothing to support biodiversity. 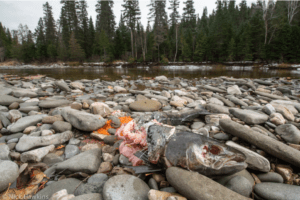 Wild Atlantic salmon have been extirpated or are in serious trouble in large swaths of their historic range, from Lake Ontario to the rivers and tributaries of the Gulf of Maine, the Bay of Fundy and much of the southern and eastern shores of Nova Scotia. Healthy populations still do exist along North America’s eastern seaboard, thanks in part to a ban on commercial fishing in the communal foraging grounds off western Greenland. Wild salmon are keystone species: they are the cornerstone of the ecosystems where they live, providing food to many other creatures and eating many creatures themselves. Balanced ecosystems lead to sustainable and prosperous human communities. Meal for wildlife: an Atlantic salmon on the shore of the Miramichi River, N.B. Let us refocus our goals for human sustainability. 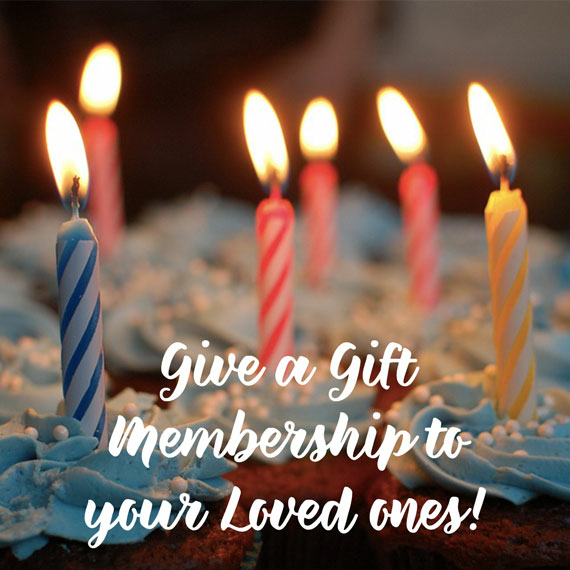 Let us plan for a future 50 and 100 years from now. In this future, biodiversity is strong and healthy and robust and resilient. In this future, Atlantic salmon contribute to the ecosystems where they’re found and provide an invaluable resource to society overall.